Night of the Furies reminds you often that it is a tragedy, a Greek one at that. Though I couldn’t help comparing it to Hamlet. Either way, vengeance directs the play. Giorgio’s the son of a Boston mob boss, a kid with a bright future. Until his mother “uncle" kill Giorgio’s dad and seize his imperial criminal birthright. Giorgio responds by doing what any Sicilian kid would do: faking his death and devoting himself to avenging his dad’s death. Published under the pseudonym J.M Taylor, Night of the Furies nonlinearly tells the story of Giorgio’s life, from his initial decision to seek revenge to dealing with the fallout from the killing of his mother and mafia boss stepfather/“uncle.” Part historical novel, part criminal biography, part morality play, Night of the Furies is deceptively complex, though ultimately unsatisfying. The biggest drawback to Night of the Furies is its parallel narrative structure. Half the book follows the aftermath of Giorgio’s matricide, the other half recounting of his criminal career up to the double murder. While the two narratives converge at the end, neither felt fully developed. It was never clear exactly what kind of book Night of the Furies wants to be: there are a couple of heists, a bit of a prison story, and, of course, the mafia. These nods to the subgenres of hardboiled fiction, however, get in the way of Giorgio’s quest for vengeance. Without belaboring the comparison, Night of the Furies is ultimately a criticism of vengeance much as is Hamlet. The novel’s final twist bears this out—but there’s nothing I will write about that. A linear narrative—whether focused on Giorgio’s biography or the killing and its unfortunate aftermath—would perhaps have made for a more enjoyable read. Without the interaction between the two narratives, however, the problem of vengeance may not emerged as it did through the parallel chronologies. Unfortunately, Giorgio’s struggle with vengeance as a moral imperative is too often intermittent, particularly in the biographical segments, too focused on normal criminal stuff. I had another issue while reading this book, one that was ultimately resolved by book’s end. Giorgio is not a good man. Big surprise, this is crime fiction. We read this stuff because we like rooting for villains, either because its fun or because its morally challenging. PI’s were loved because of their cool, which provided cover for their moral indiscretions. Would we have rooted for hitmen in the nineties had they not been pop culture junkies? On the other end, Jim Thompson's psychos are uncomfortably sympathetic, exemplified Lou Ford's intellectual detachment. Night of the Furies's Giorgio, other than his vengeance drive, is a cipher. There’s little about him to offset his villainy, sufficiently highlighted in the novel's first third. For much of the book, his amorality and shallowness bothered me. But Giorgio’s lack of personal and moral depth becomes essential to the moral resolution of the conflict. Then again, this is crime fiction. I’m probably overthinking it. 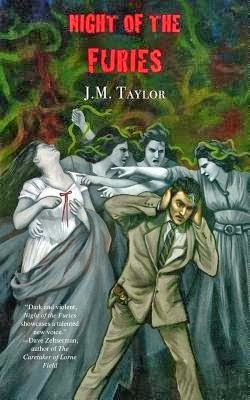 Night of the Furies is to be commended for its page count, 187!, and Taylor’s brisk pacing and unadorned, though not colorless, style. I never found myself bored and I read it fast, the two things I look for in crime fiction. It's also violent. Very violent.